Aurie controlled bi Pakistan shawn in dark green; claimed but uncontrolled region shawn in licht green. See an aa Daylicht savin time in Pakistan. 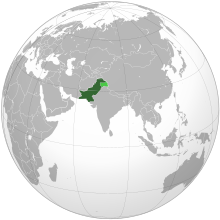 Pakistan (ofeecially The Islamic Republic o Pakistan, frae the Urdu meanin "Laund o the puir") is a kintra in Sooth Asie that haes mairches wi Indie, the Cheenae, Afghanistan an Iran. Pakistan haes an estimatit 156,770,000 indwallers. Pakistan wis whiles pairt o the Breetish Empire but becam independant in 1947, alang wi Indae. Afore than it haedna existit as a unitit state, tho fowk haes bid thare syne the sievent yearthoosand BC. Ane o the warld's auldest ceeties, Moenjo-Daro, wis in Pakistan. In 1947, efer mony years o campaignin, Pakistan an Indie war unthirlt frae Breetain. Pakistan wis creatit as the kintra for the Muslims, an Indae for the Hindus. This o coorse left the problem o whaur the Christians, Jews, Buddhists etc. wis tae bide, an thair places in the twa kintras haes been a problem tae the day. The kintra that's cried Bangladesh the nou wis whiles pairt o Pakistan (cried East Pakistan) til it becam independant in 1971. The heidmaist leid o Pakistan is Urdu. Anerly aboot 10% o Pakistani's haes it as thair mither tongue, but it haes acome Pakistan's lingua franca an aw edicate Pakistanis haes it fluent. The ae ither naitional offeecial leid is English, but ilkane o the provinces haes offeecial leids forby thon, sic as Punjabi, Pushtu, Sindhi an sae on. Punjabi haes the maist native speakers, aboot 44% o the kintra's indwallers. Mair nor aichty leids an byleids is spak in Pakistan. Some is spak bi gey few fowk, sic as Aer thatin 1998 haed anerly 100-200 speakers, while maist haes a wheen mair. Maist Pakistanis haes at least twa leids, an ken o fower or mair isna byordinar. Syne Pakistan wis foodit as a state for the Muslim fowk o the Indie sub-continent, it isna supreesin that the feck o fowk in Pakistan (96%) is Muslims, (spleet atween awmaist 77% Sunni an 20% Shi'a). The lave is maistlins Christian, Jewish, Buddhism an a tait is Anamist, maistly o the Kalash fowk in the Nor' o the kintra. Anerly 53%  o Pakistan's indwallers is leeterate. Eddication stairts at the eild o five, tho mony stairtna schuil ava. Thare is, forby state schuils, Islamic schuils cried madrassas in Pakistan that haes been creeticised for upbiggin fundamentalist Islamic support in the kintra, an as an affcome biggin up support for terrorism. Aboot 7.5% o childer in the Nor' Wast Frontier Province is jaloused tae be eddicatit in madrassas. Thare's modren varsities in Pakistan, as weel as mony airmy colleges that offers trainin for offishers an siclike. ↑ "The State Emblem". Ministry of Information and Broadcasting, Government of Pakistan. Archived frae the oreeginal on 1 July 2007. Retrieved 18 December 2013. ↑ "National Symbols and Things of Pakistan". Government of Pakistan. Archived frae the oreeginal on 13 April 2014. Retrieved 27 May 2014. ↑ "Population by Mother Tongue". Population Census Organization, Government of Pakistan. Archived frae the oreeginal on 12 September 2011. Retrieved 28 December 2011. ↑ "Background Note: Pakistan-Profile". State.Gov. 6 October 2010. Retrieved 29 May 2012. ↑ Braj B. Kachru; Yamuna Kachru; S.N. Sridhar (27 March 2008). Language in South Asia. Cambridge University Press. p. 138. ISBN 978-1-139-46550-2. ↑ Yasmeen Niaz Mohiuddin (2006). Pakistan: a global studies handbook. ABC-CLIO |. pp. 3, 317, 323–324. ISBN 1-85109-801-1. ↑ Ehsan Rashid (1977). "THE CONCEPT OF PAKISTAN IN THE LIGHT OF IQBAL's ADDRESS AT ALLAHABAD". Iqbal Memorial Talks. Retrieved 5 March 2014. Ehsan Rashid explains how concept of Pakistan and Iqbal's Allahabad address are interlinked. ↑ "Pakistan statistics". Geohive. Retrieved 20 April 2013. ↑ "Pakistan" IMF Population estimates. ↑ 19.0 19.1 19.2 19.3 "Pakistan". International Monetary Fund. Retrieved 15 January 2017. ↑ Miguel Loureiro (28 July 2005). "Driving—the good, the bad and the ugly". Daily Times. Pakistan. Archived frae the oreeginal on 10 January 2012. Retrieved 6 February 2014. This page wis last eeditit on 6 Juin 2018, at 06:29.